Hero to zero. Cop to corpse. One minute PC Harry Tasker is strolling up Walcot Street, Bath, on foot patrol. The next he is shot through the head. No scream, no struggle, no last words. He is picked off, felled, dead. Normally at this time on a Sunday morning – around 4a.m. – the streets of Bath are silent. The nightclubs close officially at three. The last of the revellers have dispersed. PC Tasker was on his way back to the police station after checking that Club XL was quiet. His body lies in a bow shape under the light of a street lap on the flagstone pavement, a small puddle of blood forming under the head. His chequered cap is upturned nearby. It’s the third killing of an officer in Somerset in a matter of weeks. The emergency services are summoned. Ambitious to arrest the Somerset Sniper, the duty inspector seals the crime scene, which is confined by the river on one side and a massive retaining wall on the other. He uncovers the murder weapon in a garden and is himself attacked and left for dead. Enter Peter Diamond, Bath’s CID chief. Throwing himself and his team into the most dangerous assignment of his career, he must outwit an adversary the likes of which the West Country has never seen – a twisted killer with a lust for police blood. As a huge crime fan I was eager to read Peter Lovesey’s latest novel featuring Peter Diamond, the twelfth in the series. Admittedly I have not heard of Lovesey before but I’m glad I picked this book up. From page one the story is intense and gripping, PC Tasker is murdered instantly and then follows the immediate hunt for the Somerset Sniper, leading to a second officer getting injured in his bid to capture the killer single handedly, all within a few pages. The book moves along at a fair pace. Diamond is the typical fictional male detective, grumpy, set in his ways and always knowing best. However when compared to his nemesis Jack Gull, head of the Serial Crimes Unit, he is a saint. Diamond and Gull pit their wits against each other in order to try to find this police serial killer and their love-hate relationship makes good reading. Almost half-way through the book we are introduced to some new characters, three women who decide to follow a suspicious character who books European business trips when also being on benefits. Is he all he seems? The friends decided to turn detective to find out more about this mysterious Mr Smith and his ulterior motives and write about it in the form of a blog. The book then moves back and forth between Diamond and Gull’s quest to find the killer, and the blog about trying to find out more about Mr Smith. From midnight stake-outs in woodland to find the sniper, through to historical research in order to link the three policemen this is a gripping read. There is a twist in the tale that obviously links these two stories but I have to admit I sort-of missed it. The conclusion of the book wasn’t quite what I expected it to be and I was a little let down. Having said that, the pace was quick and the characters and dialogue strong enough to keep me turning the pages. 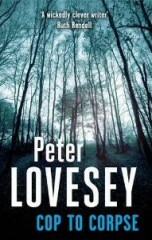 I will certainly read another Lovesey book and think this is worth a read for any crime fans out there. Not to sure if this is a read for me or not but I love the title. Hm, I wonder if all of his books have that hidden twist of just this one. Sounds interesting but too bad the end was a bit of a letdown.